Researching Food History - Cooking and Dining: Charles Darwin and... rice?? Chocolate. There is one recipe in her cookbook for chocolate - a 'Chocolate Cream' or blancmange made with powdered gelatin. The gelatin, grated chocolate and milk were heated in a double boiler - a jug set in a saucepan of water over the fire. This Chocolate Cream is not your mother's jelly mold, but a thick creamy dessert - a mix of custard and jelly. Before powdered gelatin, in the late 1830s, jellied dishes required boiling of calves/pigs feet (messy, smelly), isinglass (from fish, also smelly), and hartshorn (the ammonia smell can - did for me - cause headaches). Nesselrode Pudding was an ice cream loaded with candied fruits, like a frozen fruit cake or... the tutti frutti ice cream of the 1960s. It can be very complicated, as seen in examples HERE. Emma's version varies from those by using pounded almonds or almond flour instead of the typical chestnuts; with brandy, cream, milk and egg yolks in a basket mold. The popular ice cream started appearing in the 1830s and was named for a Russian diplomat. Vegetables, meat, fish, cheese, macaroni and other dishes, sweet and savory, are included. The Potatoe Rissoles are mashed potatoes encasing rolled (like "Veal Olives") beef or ham slices. Other rissole recipes of the time used minced meat. Each of the above recipes turned out quite delicious. There are several more dishes I am getting ready to try. For those not acquainted with 18th and 19th century recipe names, don't be put off by Scotch Woodcock - a cream sauce with anchovies on toast, not a bird. And now to the RICE. Amid all his journal and book writing, Charles Darwin found time to write down the recipe "To Boil Rice" in Emma's book. What a nice husband. He included the precise instruction to boil the rice and water "...twelve minutes by the watch..." and the minutes necessary to set the drained rice over the coals. An image of his written recipe is included in the lengthy historical introduction. Dusha Bateson and Weslie Janeway have a lyrical way of writing the background and instructions for each recipe, with such phrases as "wonderful piquancy," "Burnt Rice is rice pudding with pretensions," and the "salad is a simple modern dish - perhaps 'timeless' is a better way of describing it." They discuss some problems they encountered in converting the recipes into modern interpretations. As a hearth cook who works on old recipes so often, it was interesting to read their thought processes from their modern perspective, and puzzle over implements I use often (type of oven, salamanders, broilers/gridirons). 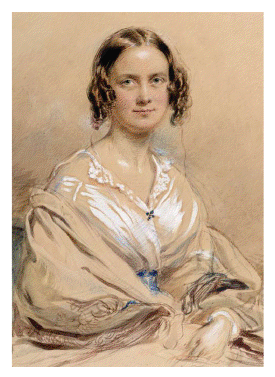 Most importantly, they have brought Mrs. Darwin forward on her own, and her excellent choices of recipes. 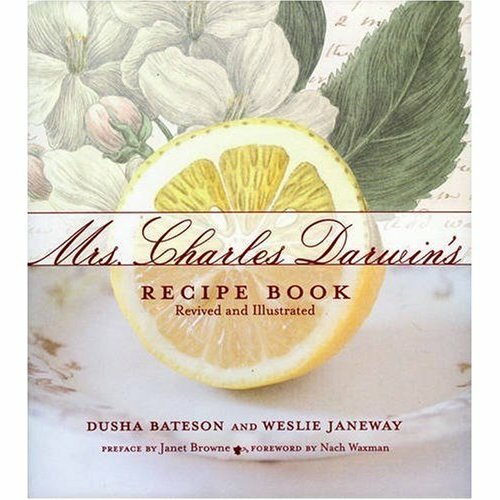 Mrs. Charles Darwin's Recipe Book, Revived and Illustrated, by Dusha Bateson and Weslie Janeway. NY: Glitterati, 2008. All the photographs are from the book. I never knew that Charles Darwin has its own recipe .. in fact he loves to cook ... I would like to try those!